When a man of conviction, character and success tells you that football players make football plays, it goes from trite to profound in an instant. Helluva man, Knox. Chuck Knox was so bedrock earnest when he said it, there was simply no argument. Or alternative. Or snickering. Or change of subject. The listener had to either accept the epic triteness or be burnt to a crisp by Knox’s baby-blues stare. But Knox was no one’s fool. He was brilliant. As a football tactician, as a motivator of people and as a manager of his circumstances. His deployment of aphorisms, bromides and cliches was his way of controlling media, fans and many players. Besides the fact that all of his sayings were true — the very definition of cliche — he offered them with such conviction, backed by success, that most listeners accepted them as some sort of divine providence, and shared them with others. The only problem was, none of us had the strength of his character, so listeners started stepping backward, and looking sideways for doors. Since the Seattle era of Knox, who died Sunday at 86 in Palm Springs, CA., from complications of dementia, was from 1983 to 1991 — when people believed that Amazon was a river in South America — there’s a few things worth sharing about the man from Sewickley, PA., who is the only one in history to be NFL coach of the year with three franchises (including the Bills and LA Rams). He took the Seahawks to their first playoffs in 1983, 1984 and 1985, including a 27-20 shocker over the Dolphins in Miami’s Orange Bowl, where they were eight-point underdogs. In 1986, despite winning 10 games, the Seahawks didn’t make the playoffs, but did beat the teams that played in the Super Bowl, the Broncos and the Giants. He could play his semi-immortal Ground Chuck offense behind RB Curt Warner, or he could adapt to the air, as he did in 1989 when he helped pull 3,309 passing yards from QB Dave Krieg, a mutt from defunct Milton College who lasted 19 years in the NFL. 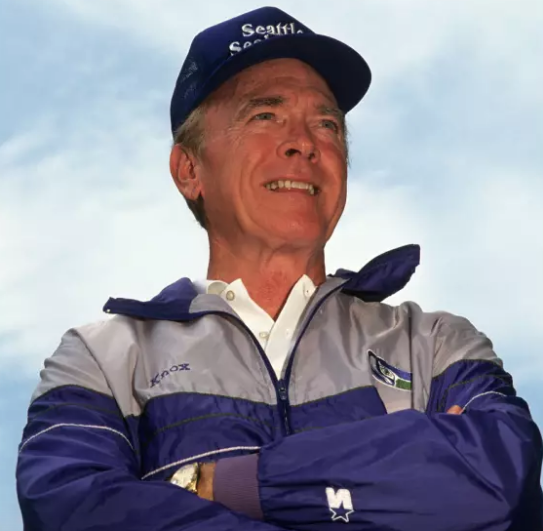 It took the longest time for the Seahawks to recover from his 1991 departure, a resignation forced by the blithering ignorance of owner Ken Behring, who bought the team from the Nordstrom family in 1988. From the Seahawks’ playoff appearance following the 1988 season, they did not return to the postseason until 1999, and did not win another playoff game until 2005. Expect nothing. Blame nobody. Do something. Perhaps the ultimate embodiment of that directive came the year after that win in Miami. In the 1984 wild-card round against a formidable Raiders team led by madman DE Lyle Alzado, Knox had to scramble when tackle Ron Essink, likeliest to draw the assignment of blocking the ‘roided-up Alzado, curiously called in sick the morning of the game. Knox threw away the game plan. “His backup, Sid Abramowitz, was a nice person, but not much of a football player,” Knox said. Behind running backs Dan Doornink, David Hughes and Eric Lane, the Seahawks rushed the ball 51 times for 205 yards and won, 13-7. Krieg completed four passes in 10 attempts for 70 yards, none to Steve Largent. For people who suggest that Knox’s reliance on axioms signaled an absence of creativity, please recall that game and shut up. Knox is most remembered by players for the genuineness of his warmth, even after occasionally being targeted for a profane tirade. My last encounter with Knox was in 2005, a teleconference at the Super Bowl in Jacksonville. As a teenager, he made 83 cents an hour working the 900-degree pots of molten steel in Pennsylvania plants, the son of a steelworker father and a mother who painted houses. The subject of the phone call was his donation of $1 million to endow a history chair at his alma mater, little Juniata College of Huntingdon, Pa. Knox had planned to be a history teacher, and fulfilled a part of that ambition by funding others for decades to teach his academic passion. Considering that he retired before pro coaching money grew huge, his investment in Juniata was considerable. “I still have some small change left,” he said, laughing. “I’ve been donating every year and helped them with their football stadium, just 3,000 seats. Seattle, the Seahawks and the rest of NFL and the sports world at large are grateful that Juniata enraptured us with a man who told us football players make football plays. Who knew? I liked Coach Knox and enjoyed his years with the Hawks. Good man. I think that was tattooed on every player just after signing. The Chuck Knox Era will always be my favorite period in Seahawks history. Seattle was still a perennial underdog, but he turned the team into a legitimate contender. We always remember most warmly the first success. That picture of him and Bosworth embracing just about broke my heart . I will never forget the 80’s ; I got married , 2 of my 3 children were born , Stevie Ray Vaughn burst on the scene ( I play guitar so that was a big deal to me ) , and sitting on my couch with my daughters on my lap screaming “Go Seahawks” on a Thanksgiving Day while my wife made turkey dinner and the Hawks played Dallas . I remember the day the team hoisted him on their shoulders after the Dolphin victory like it was yesterday . We lost to the ever-hated Raiders in the AFC Championship the next game . I bought his autobiography ‘ Hard Knox’ when it came out ; he was an amazing man with one hell of a tough childhood . Blair Bush once told me he was the best coach he ever had , and he played for Don James at Washington . How tragically sad one of the sharpest minds in football wound up with dementia . God rest you Charles Robert Knox . Thanks for everything coach – Seahawk fans will never forget you . Written from the heart, my man. Well done. I miss the AFC West of the 80s. The Raider Busters, Ban The Boz, Chargermania days. Heck, the Chiefs even had their own LOB back then. Even Chuck Jr brought some memories to the area as a player for Bellevue. “It’s not who you play, it’s when you play them.” I use that all the time. Applies to life in general, too. I’ve also used the quote in columns explaining how upsets happen. Seattle fans love their coaches having big personalities. Lou Piniella, Mike Holmgren and George Karl certainly were, Pete Carroll is in a rah-rah way, even Sigi Schmid was to a lesser degree. Chuck Knox was certainly a big personality, but not with the volume or enthusiasm of the others Like Don James and Marv Harshman, Knox did it with a steely presence, no-nonsense attitude, C.V. and gravitas. If you could get past his command presence, he had a deep well of warmth that endeared him to all who experienced it. Because of my age (12) and the Seahawks ineptitude and incompetence prior to his arrival, Chuck Knox will always be my favorite Seahawks’ head coach. I taught middle school with an older colleague who was once a dominant athlete in his 20s. A typical alpha-male type, but also insightful, thoughtful. He also liked to tell jokes and chat up strangers a little bit. He told me about the time that he attended a Seahawks training camp….he was off to the side after practice had started, but Knox was still not on the field. My friend was just talking/joking with some other bystanders when Knox was driven by him on a golf cart on his way to the practice field. To balance all of that intensity, I equally appreciated the obvious love that he had for his players and the city of Seattle. He was quite a man. Your friend was not alone in his response to a Knox stare. Don James had a good one too. I’ll never forget the playoff game against the Bengals. Their hurry up offence that no one could solve. Instead of whining about it Chuck simply had a rash of Joe Nash knee injuries. Whyche on other side of field screaming at Chuck “ F you F you. “Joe was having a tough time with his knee “ Chuck said “ i got my changes in.” Sadly we lost but Chuck was being Sewickley. That was one of the more hilarious episodes in team history. You’ll be glad to know Joe walks without a limp these days. This one goes in the scrap book. Nicely done. Thanks Art! The ‘Hawks missed the playoffs in 1985. That was the year they won two, lost two, won two …… and finished 8-8. I recall when Coach Knox had his own show on KOMO after MNF. He’d be asked his thoughts on who’d win games around the NFL the following weekend and he had an incredible success rate. He wouldn’t predict the spread but did on who the victor would be and impressed people enough that if anyone missed the show they’d call KOMO. My other favorite memory of him beyond being carried off the field in Miami was winning in Kansas City. Chuck bought everyone drinks after the game. Nice article Art. It was fun going down memory lane.